As many Colombian cities struggle to keep public transit ridership levels, one city is innovating using technology, gender-sensitive employment, and ideas from Asia to curb the “mototaxiing revolution” and restore ridership loss. An increasing “motorbike revolution” – represented by spectacular increase in motorbike motorization and reliance on door-to-door motorized services – has changed the rules of the game and cannot be obviated in transport systems. Flicking through the Uber website, we found that the company used to offer an “UberMoto” service in Paris from 2012 to 2013. Meanwhile, on the other side of the Atlantic, the local Colombian newspaper headlines discuss the legislation forbidding male passengers on motorcycles in a number of cities in an effort to curb moto-taxis. The impact of motorbikes cannot be ignored. 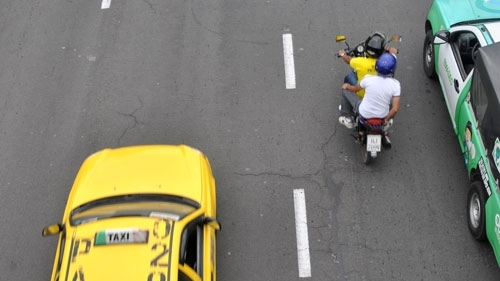 Purchase of motorbikes and operation of moto-taxis have been identified as key drivers for a modal shift from public transit to private vehicles in many places around the world, including Colombia. The nationwide phenomenon of moto-taxis has revolutionized mobility in small and medium-size Colombian cities, and has become a source of income for many. Motorcycle riders and passengers have long been vulnerable users of motorized transport. In the Americas, with the increasing ownership of motorcycles, given the ease and lower costs, this trend is worrisome as the number of vulnerable users as well as those impacted by traffic crashes increases, sometimes masking a shift from pedestrian or bicycle casualties to motorcycle victims. These trends would be similar in regions such as Africa which also share the motorcycle-taxi (mototaxi) phenomenon.